Be careful with your refrigerator without fridge air filter ! Be careful with your household refrigerator without fridge air filter ! In the past, we all thought that eating the rest of the food, or storing the food in the refrigerator is the safest and most hygienic practice, but we never expected it. The food will be attacked by mold in the refrigerator! At this time, you need the refrigerator air filter to help you ! When food is stored, it is easy to cause bacterial cross infection. Fruits and vegetables contain enzymes . In the air at a suitable temperature and humidity, numerous chemical changes occur in nutrients, which can easily lead to spoilage of food. Be careful with your household refrigerator if there is not the fridge air filter ! Meat, eggs, and fish are highly prone to the growth of microorganisms such as bacteria because of their high nutrient content, high water content, and good pH. When the nutrients in the food are destroyed by bacteria, the degradation products such as ammonia, ketoacids, sulfur and urine are the causes of their pungent odor. 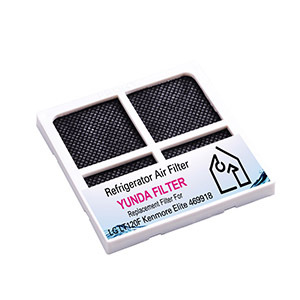 Yunda multi-layered fridge air filter design has a superior absorption effect and can filter a large range of impurities of different practice sizes.The filters are over 15-30 times more powerful than baking sode, because it has high efficiency multi-layer structure. Main filter media is activated carbon fiber, and the other filter media is activated carbon sponge and activated carbon cloth. The large air filter of the refrigerator can kill the bacteria inside the refrigerator, and inhibit the odor of the refrigerator, so that the ingredients can be preserved for a long time. It is essential for home use.